Next Monday is PanCan Day. 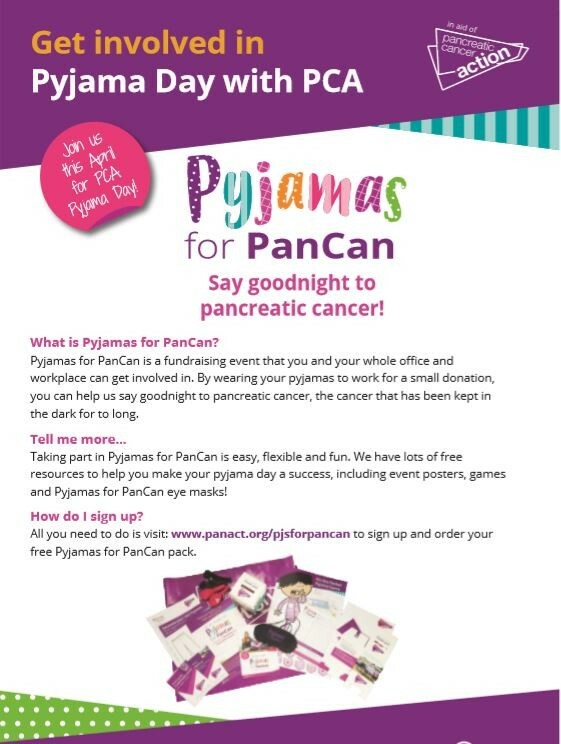 Wear your pyjamas to work and help say goodnight to pancreatic cancer: the cancer that has been kept in the dark for too long. With your help in raising funds and awareness, more patients are diagnosed at an early stage so that they have the best chance of survival. Find out how to raise funds and take part. It's the UK’s fifth biggest cancer killer and yet it receives less than 3% of cancer research funding. Having a history of certain health conditions – such as a stomach ulcer and Helicobacter pylori infection (a stomach infection). Pancreatic cancer by itself (not part of a known syndrome) runs in some families. People with first degree relatives (mother, father, brother, sister) diagnosed with pancreatic cancer have an increased risk of being in that type of family. Mid-back pain or discomfort: Where a bra strap would sit and may be eased by leaning forward. Indigestion: Not responding to medication. Pale and smelly stools: That don’t flush easily. Patients with symptoms that suggest they have pancreatic cancer need quick investigation, usually by a CT scan and early referral to a specialist unit for other investigations. Speak to your doctor or occupational health provider if you have any concerns.